This is a pretty clean and simple "man" card......no bling just 1 button!! 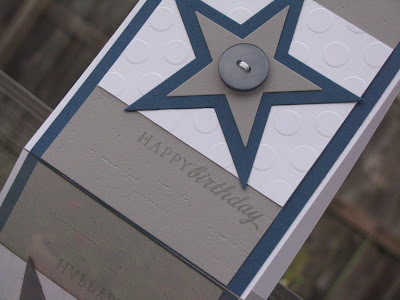 Seeing Stars dies from Papertrey. 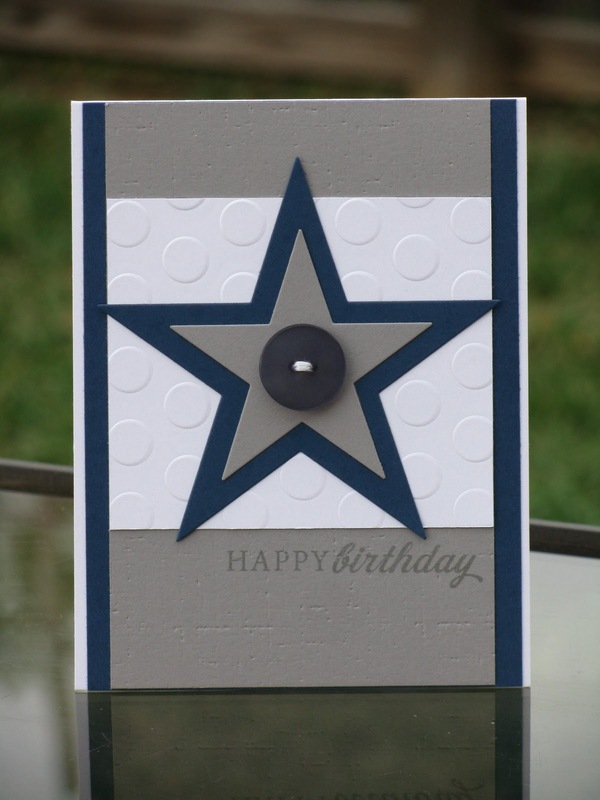 He LOVES the Dallas Cowboys and thought why not make a card in those colors! My hubby's card fits for the challenge over at Wee Memories this week. 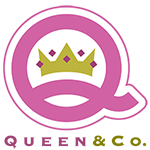 It's not too late to come play along with this fabulous challenge....you have until midnight! for NO RAIN on Sunday! I so wantt hose Stars! I should have left them in my caert last month. Great man card-especially for a Cowboys fan. Such a FAB guy card--and you could easily change out the colors for any other team as well! Super! Thanks for playing the WMC this week! Great card for your hubby! 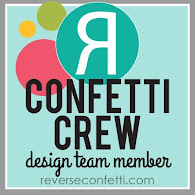 I love how you mixed the polka dots with the canvas IP ...it's the perfect texture! The star dies are absolutely perfect for this too! Awesome card! I'm saving to case it later. I too have a Cowboys fan...er that's not the proper word..Cowboy's nut in my house. Lets just say that every year, he has his own Cowboy's Christmas tree and the den...well that's decorated in gray and blue. Yup, he's a fan. This card will be perfect for his birthday! That is a great card! Don't you love those dies? So striking...I just ordered these dies and can't wait to get them! Great job! Hmmm...I think I need to get those star dies now...great use of them for a masculine card. I love the texture as well...nice touch! 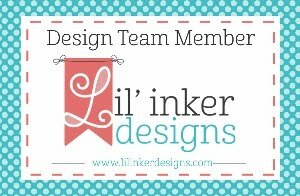 Flutterby Friend Mini Blog Hop! Halloween Treat Decor and some cute pics! Snowy Wishes and a challenge too! 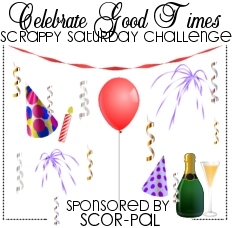 Limited Supply Challenge Blog Hop!